SHOP SMART, SHOP CHEAP, SHOP QUALITY! * A. Full Height (Ground to Pin): 102"
* B. Clearance (Bucket Dump at 45°): 74"
* C. Reach at Max Height (Bucket Dump 45°): 29"
* Q4 Lift Capacity at Full Height: 1800 lbs. * R. Breakout Force (Bucket Blade): 3000 lbs. 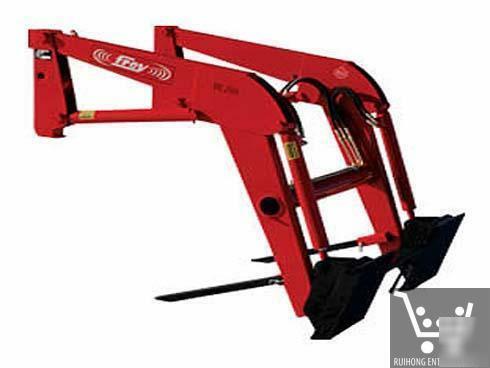 Note: specifications will vary depending on hydraulic pump flow rate, pressure and tractor size. Particular units are carried in stock and these can be found listed within our storefront and are listed as "IN STOCK" . If you are interested and would like confirmation for units available and are "IN STOCK", please inquire using the "Ask Seller A Question" link. - Personal Cheque's are not accepted and will be returned upon receipt. LOCAL PICKUP IS PERMITTED FOR THIS ONLINE LISTING! By purchasing any of our items, the purchaser agrees that this seller and their agents, servants, employees, officers, directors, trustees and all other persons or entities acting on their behalf and the manufacturer, is not responsible for any accident or injuries that may occur for any reason (including manufacturer's default) during use of the purchased goods. Carefully review User Manuals provided with the purchase (only if available and applicable) for instructions and use. Purchaser must comply with all provincial/state laws and safety procedures where purchaser intends to use their purchase (only applicable to certain products such as ATV's, mini/pocket bikes sold by this seller. 7% PST for ONLY BC Residents in Canada. No Sales Tax will be applied for those residing in the US. Absolutely brand new ! All products in our inventory are Brand New and come new in their retail box unless otherwise advertised through the listing. How can you guarantee that the product purchased is in working order? How long does it take for items to arrive? Do you accept local pickup for items sold? Further FAQ's (frequently asked questions) and answers will be included in future listings or when further revisions are made to this listing.